Food Photographer & Stylist - Motif Lifestyle Images Ltd.-Getting in the mood for Christmas...? 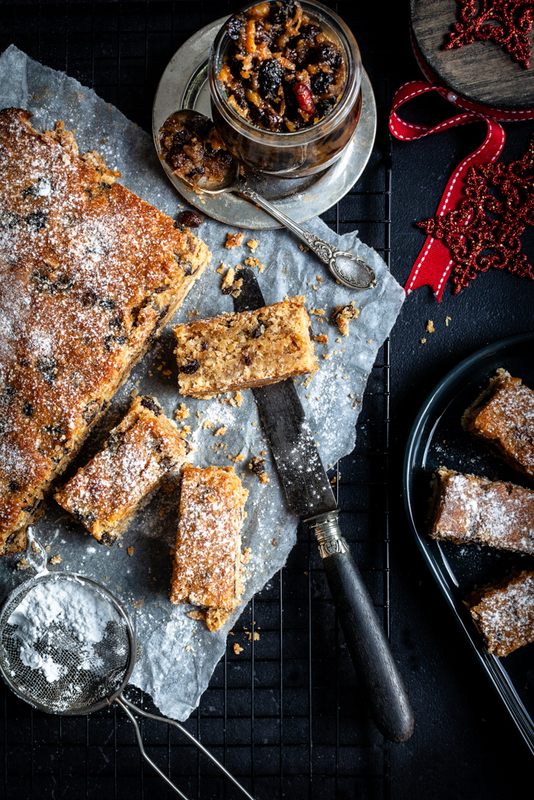 To get everyone in the mood for Christmas, Jen has cooked up a yum Christmas Mince Slice. Yes I know it’s still November, but Christmas is officially one month away! 1 cup fruit mince – homemade is best! In a food processor pulse the chilled butter with the flour, oats, almond meal and coconut sugar, until breadcrumb consistency. Press into lined slice tin (20 x 30 cm or you can use a small square one, the slice will just be thicker). Bake at 160°C for 10 - 12 mins. Sift all the dry ingredients into a large bowl, mix well and add wet ingredients. Pour over the cooked base and spread out evenly. Cook for a further 25 - 30 mins or until the topping is set and golden. Cool before slicing, and dust with icing sugar. Great with a cup of tea & freezes well.